Most houseplants are bought as young or established plants from garden centers and nurseries. Even so, it is advisable to have a supply of young plants ready to replace the originals once they are past their prime. You may also wish to have several specimens of a particular plant around the house, or to have spare plants to give to friends. If this is so, you needn’t buy more plants—it is quite easy to increase your stock of many specimens by a variety of means. No specialised equipment is needed for propagating the easier species, although a seed tray with a clear plastic lid is cheap to buy and always worth having. A propagator with bottom heat will certainly help you to increase your stock of some of the more difficult subjects. Cuttings Probably the method most often used to increase houseplants is to take cuttings. A cutting is taken from the parent plant and encouraged to make its own roots (or sometimes shoots). 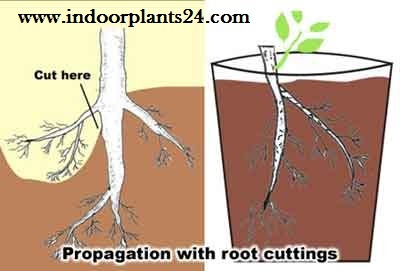 Two types are used to propagate houseplants: stem cuttings and leaf cuttings. These are generally taken in spring or early summer. Snap a healthy young shoot, preferably without flower buds, from the parent plant. If it will not snap cleanly, use a sharp knife and cut just above a node. 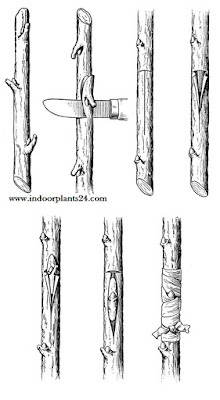 The length of the cutting will vary, but it should have at least three or four pairs of leaves or leaf nodes (joints) between the tip and the base. Use a sharp knife to trim the base of the cutting to just below a node and remove the bottom leaves to give a clear portion of stem. Rooting powder is recommended for some species, athough most do just as well without it. If it is used, a light dusting of powder on the base of the stem is all that is needed. Fill a shallow pot or seed tray with moist rooting medium and press it until it is firm. Scatter a thin layer of sharp sand on top. 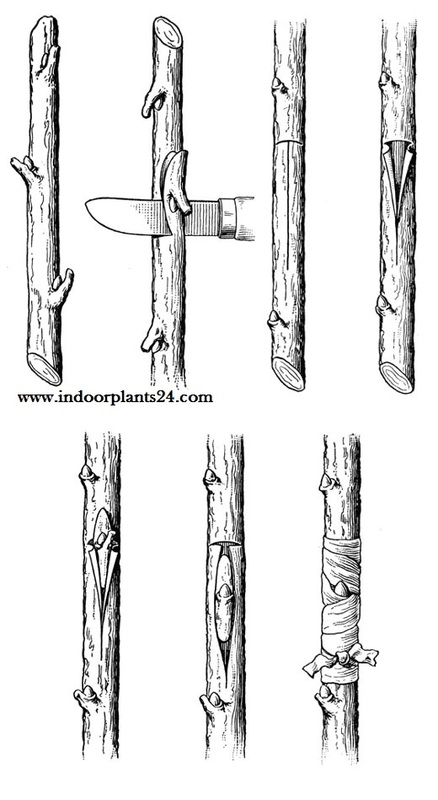 With a pencil or dibble, make holes in the medium for the cuttings, and insert them into it, making sure the base of the cutting is in good contact with the medium. Firm the medium lightly. Space the cuttings so their leaves do not touch and water the completed tray or pot, using a sprinkler head on the can. Put a plastic cover over the tray and place it in a warm (68°F/20°C), bright location out of direct sun. 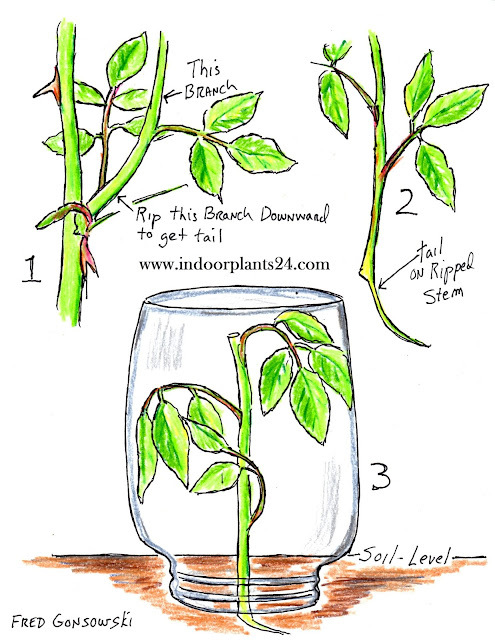 The time the cuttings take to root will vary, but eventually they will start to look fresh and to grow from the center. Thev can then be potted up individually. Some fleshy-leafed plants can be propagated from their leaves. The new plants are produced from either the plant’s leaf­stalks or from the veins. Saintpaulias, the African violets, for j instance, are generally increased from leaf stem cuttings. With a sharp knife or razor blade, cut off a fully opened, healthy leaf at the base of the leafstalk. 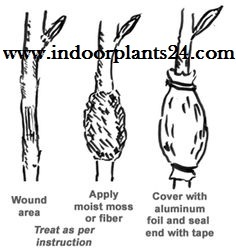 Trim the stalk to l-lV2in/2.5-4cm long, dip the base in hormone rooting powder, | and insert it, at an angle, into moist I rooting medium close to the edge of a small pot; bury about two-thirds of the stalk. Firm the medium gently and then j place the pot in a warm location in light | shade. Keep the medium just moist, and plantlets will appear within about eight weeks. Once they have grown into I strong young plants that can be handled easily, remove them from the pot, tease the plants apart carefully, and pot them individually. Saintpaulias will also root quite easily in water. Some plants—streptocarpuses and begonias, for example—can be propaga­ted by leaf vein cuttings, which are taken in one of two ways. Remove a healthy, fully formed leaf 1 cleanly from the parent plant. Cut the ‘ leaf horizontally into three or four sections, or split it lengthwise straight up the center of the midrib. Use a razor blade or sharp knife to make the cuts. If you cut the leaf into horizontal sections, make sure you know which is the top and which the base (the part nearest the leafstalk) of each section. Dust the bases or the split midribs with rooting powder and insert them to about one-third of their depth in moist rooting medium in a pot or seed tray. Plantlets will be produced in the same way as with leaf stem cuttings. Several plants naturally produce small plantlets around the outer edge, which can be carefully removed and potted. separate the offsets from the parent plant; you may need to use a sharp knife to cut through the rootstock. Keep as many roots on the offset as possible. If there are none, keep the newly potted offset in a warm, humid atmosphere and treat it like a cutting. Roots should form within a few weeks.